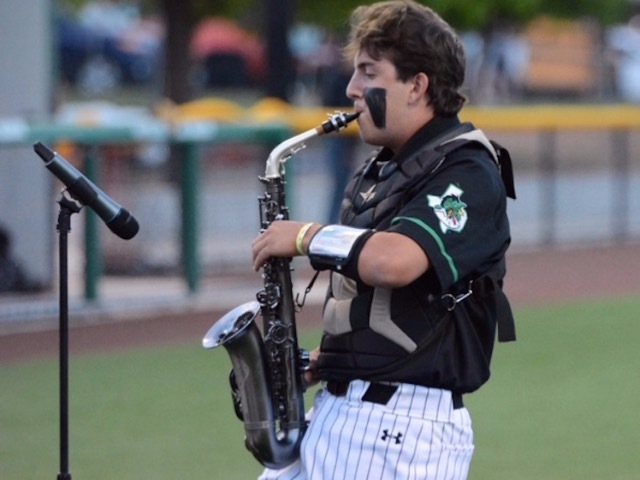 Where do you ever see a hind catcher playing a horn? Why Dragon Baseball Senior night, of course. You never know what you are going to see at the ballpark. Dragon Baseball honored 11 seniors prior to its series concluding game with Keller Central on Friday night. This senior class helped bring home the program's third state championship in 2018. And now they will soon set their sights on another. Tonight they rolled over the visiting Chargers with a 5-0 shutout victory with some significant help from their underclassmen friends. The Dragons, 17-11, 9-1, shut down the Chargers behind the arm of starter Joe Steeber and reliever Ryan Pehrson. The Dragon offense scattered single runs in the 1st and 5th innings and three runs in the 4th. Catcher Thomas Wrehe led the Dragons in RBIs with two. Up next the Dragons open a series with last year's 5A state champion Eaton. The state champions from the state's two highest classifications last year begin their series at Eaton on Tuesday, April 16th at 7pm.